On the 8th of October 2005, a violent earthquake of magnitude 7.5 struck Manshera District and near by Azad Jammu Kashmir killing thousands of people. According to the UNCIEF, 90% of Manshera city’s infrastructure was damaged and destroyed. The earthquake caused large scale destruction to homes, medical centres, schools and mosques. It also injured thousands of civilians and majority of them were children as they made up half of the population of the areas affected by the earthquake. Injured people from the surrounding areas travelled to the District Headquarters hospital (DHQ) in Manshera for medical treatment. The Pakistan Army airlifted hundreds of people on daily basis to the hospital while others arrived on foot and other means of transport. Children were also being treated in Islamabad’s largest hospital- the Pakistan Institute of Medical Sciences (PIMS) (UNICEF, 2005). The devastating 2005 earthquake in the Manshera District destroyed 43 medical facilities including District Headquarters hospital increasing the need for good quality medical services for the affected people and community members. Efforts have been made to reconstruct the health sector and until last year, 25 of medical facilities (58%) have been rebuilt (Dawn, 2012). Manshera District still requires more hospitals to meet the demand of patients. 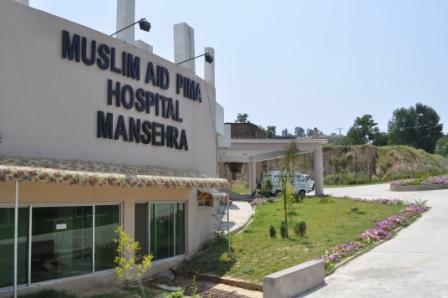 In order to respond to the increasing demand of good medical services, Muslim Aid has funded and built a charity hospital in collaboration with the Pakistan Institute of Medical Sciences. The hospital was inaugurated in 2012 and consists of 50 beds which cater for both indoor and outdoors patients. The hospital also has an in-patient department with a fully functional operation theatre capable of performing major types of surgeries. The hospital currently provides service in six areas which will be enhanced upon the completion of the second phase. The outpatient facilities include a diagnostic clinic consisting of a complete medical laboratory and a radiology department. PIMA is responsible for running the hospital and managing day to day affairs. Muslim Aid also provided the hospital with medial supplies such as 40 electric and automatic patient beds, 1 portable ECG machine, 1 portable Ultrasound machine, 1X-Ray machine and furniture for office and patients. In addition, a small mosque was also been constructed in 2012 with financial support from the Qatar Charity. The hospital has been providing health services to patients from Mansehra and other areas like Balakot, Battagram and Kohistan. It is estimated that over 10,000 patients will benefit each year from this charity hospital. According to the country director of Muslim Aid, Khubaib Ahmad Wahidi, the hospital provides modern health services to the patients and would be the second largest hospital in Manshera city after the King Abdullah Teaching (DHQ) hospital. Muslim Aid new plans to build another floor on the existing hospital structure to double the capacity if services offered at the hospital. Donations for the project may be made to Muslim Aid, Mansehra water project through http://www.muslimaid.org.